George Barnie of Ramscraigs died at Tormore 4th August 1914 aged 97. Wife Catherine Henderson died 3rd June 1920 aged 89. Son William Barnie died at Fort St. John BC September 1919 aged 46. Daughter Charlotte Barnie died at Wick 23rd August 1940 aged 83. 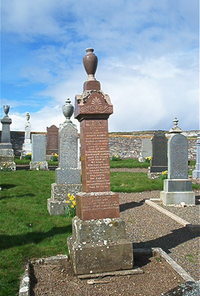 Daughter Catherine Barnie died at Wick 17th July 1942 aged 84 wife of Thomas Inglis.